Flying above the nature of Clayoquot Sound near Tofino on Vancouver Island in British Columbia, the aerial view is astounding as the fog begins to disperse. Clayoquot Sound is a spectacular nature area on the west coast of Vancouver Island that covers a vast amount of nature's most picturesque rainforest in British Columbia. 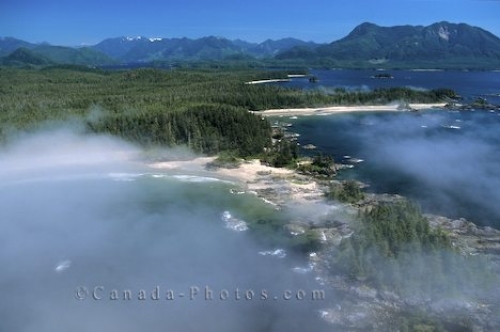 Aerial picture of Clayoquot Sound on the West Coast of Vancouver Island in British Columbia, Canada.